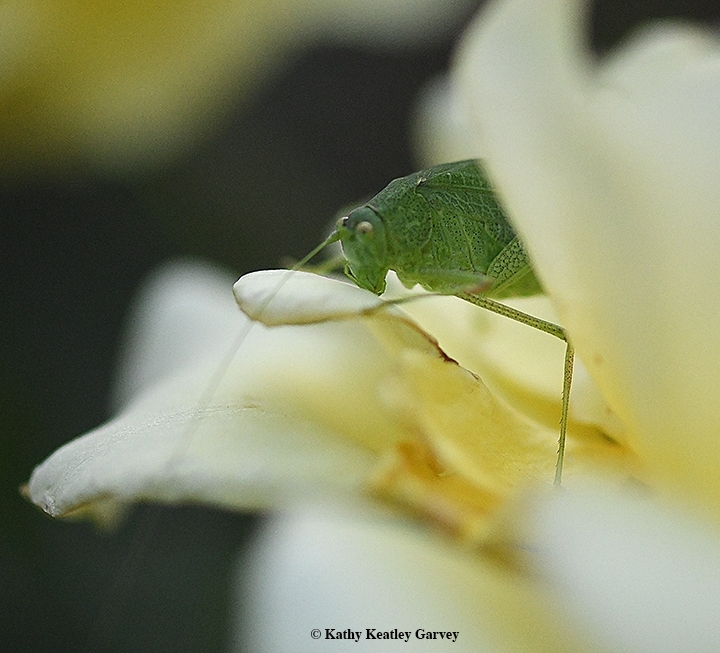 I've always rather liked katydids. Anyone who is called "Kate" or "Katy" in their childhood usually winds up with "Katydid" as a nickname. And they repeatedly hear "Katy did. Katy didn't" (the sound the insect makes). 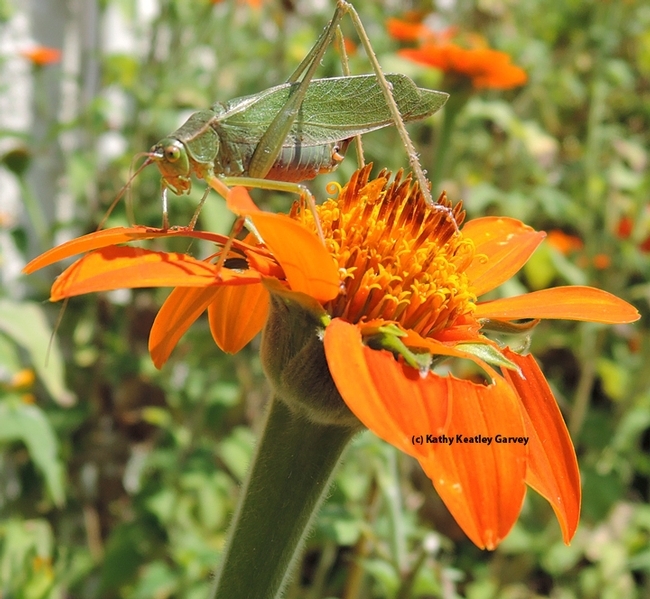 So when a katydid appeared on our Mexican sunflower (Tithonia) this morning, yours truly (once a Kate and a Katydid) grabbed a camera. Up close, they look like prehistoric animals, a mini version of the huge dinosaurs that roamed the earth 245 million years ago. From the family Tettigoniidae and the order Orthoptera (grasshoppers, crickets and katydids), they're found throughout the world except in Antarctica. 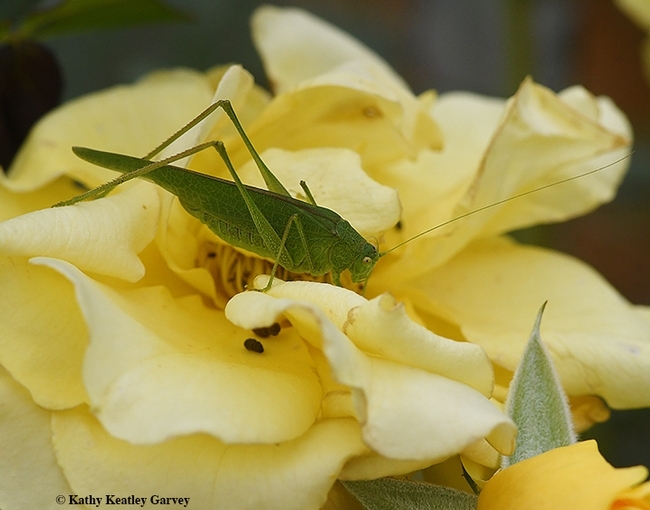 Sometimes katydids are called long-horned grasshoppers or bush crickets. 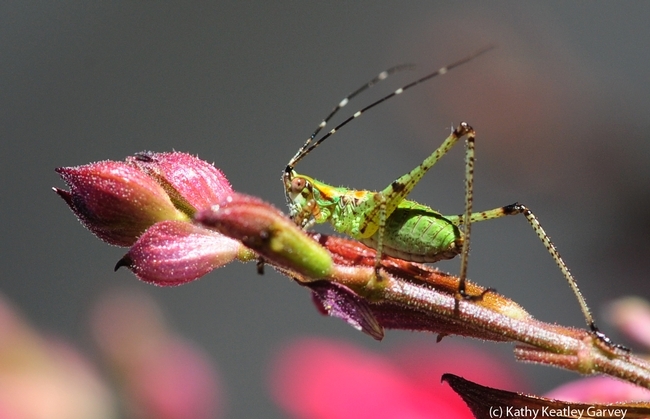 Fruit growers know the katydids as pests. They scar fruit such as citrus, taking a bite from one and moving onto the next. You can imagine what that does to the market value. 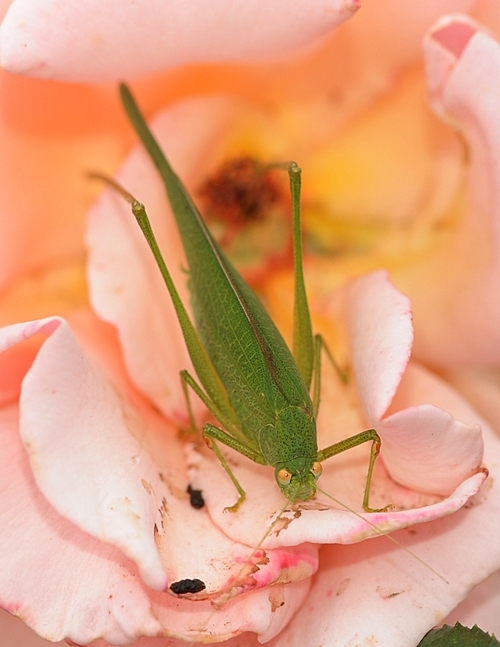 The UC Statewide Integrated Pest Management Program (UC IPM) provides information about the forktailed bush katydid: (Scudderia furcata) and the angularwinged katydid (Microcentrum retinerve) in its Citrus Pest Management Guidelines: "Of the two species feeding on citrus, only the forktailed katydid causes economic damage. This species feeds on young fruit at petal fall with subsequent buildup of scar tissue and distortion of expanding fruit. 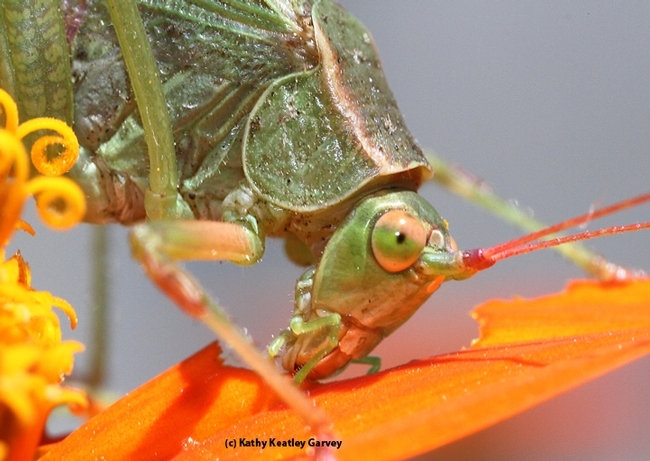 Katydids take a single bite from a fruit and then move to another feeding site on the same or nearby fruit. 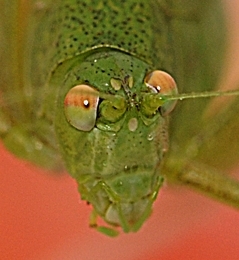 In this way, a few katydids can damage a large quantity of fruit in a short time. They also eat holes in leaves and maturing fruit, creating injury that resembles damage by citrus cutworm. The angularwinged katydid is less abundant than the forktailed katydid and feeds only on leaves." 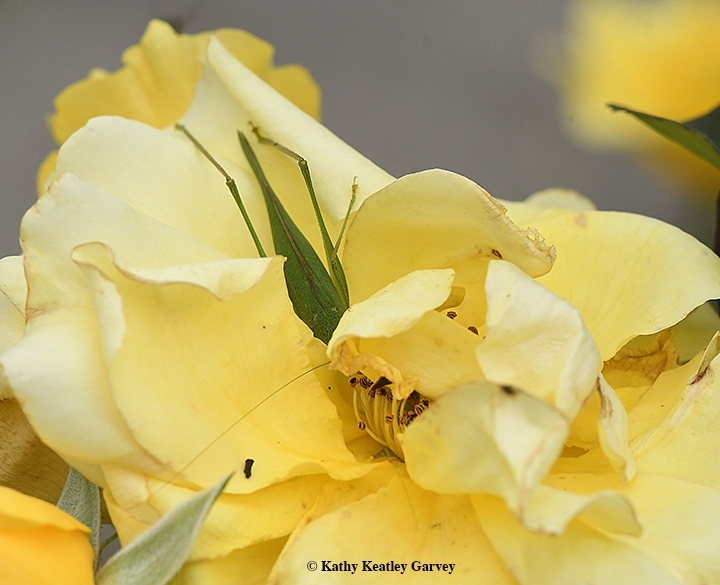 Katydids also damage such fruits as pomegranates, pears, peaches, plums and apricots. "Our" little katydid fed on the petals of the Tithonia, stopping occasionally to look at the photographer. Katy did and then Katy didn't. What's that hopping on our patio? At first we thought it was a grasshopper. Not! It was a katydid, sometimes called a "long-horned grasshopper," from the family Tettigoniidae (as identified by Lynn Kimsey, director of the Bohart Museum of Entomology and UC Davis professor of entomology, and native pollinator specialist Robbin Thorp, emeritus professor of entomology at UC Davis). "Katydids have long, threadlike antennae," said Kimsey. "Grasshopper antennae are rarely much longer than the head." Said Thorp: "Note the long slender antennae (as long as or longer than the body); the very long slender jumping hind legs; and the scimitar-like ovipositor at the end of the abdomen." Scientists tell us that the number of described species in the family Tettigoniidae exceeds 6400. Most katydids are green. They're often perfectly camouflaged in bushes and trees. A katydid. The name is derived from the "song" it sings by rubbing its wings together. "Katy did." "Katy didn't." It hopped away, but not before we captured its image. My late father, who called me "Katydid," loved poetry. Decades after he passed, a cousin gave me a set of his books from his childhood home. One was "The Early Poems of Oliver Wendell Holmes," published in 1899 by T. Y. Crowell and Company. 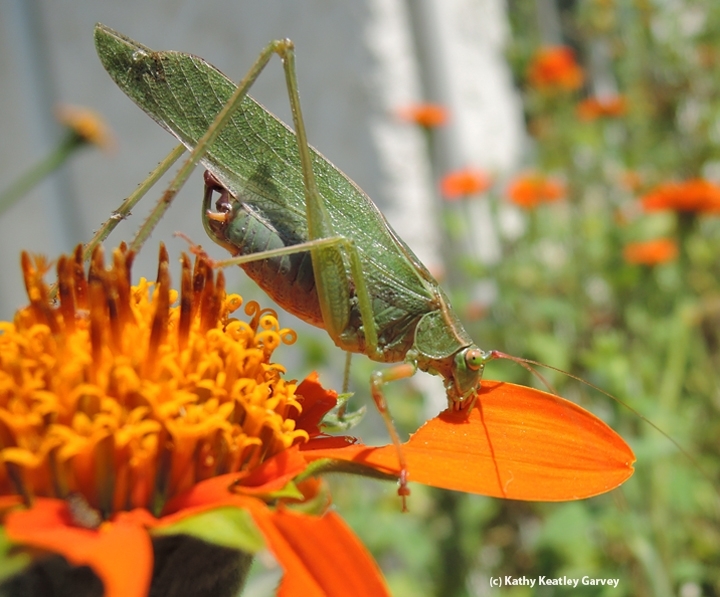 In it is a poem, "To an Insect," and it's about katydids. In such a solemn way." Holmes (1809-1894), a physician, poet and professor, goes on to describe the sounds of a katydid as "thy piercing notes, so petulant and shrill" and asks "Oh, tell me where did Katy live and what did Katy do?" 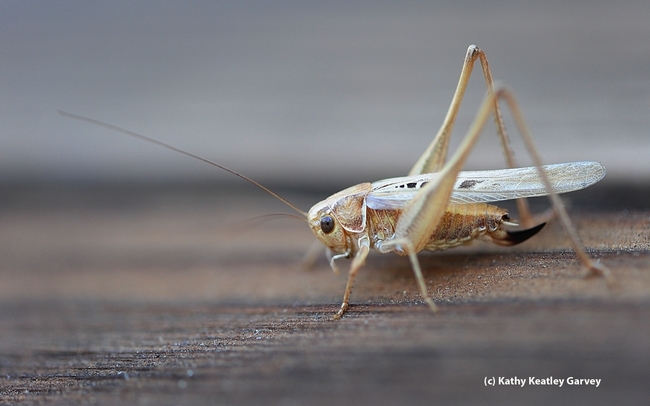 Katydids, like grasshoppers and crickets, belong to the order Orthoptera. The katydid family, Teggigonildae, includes more than 6400 species. They're found throughout the world, with the greatest diversity in the tropics. They live where their host plants are. 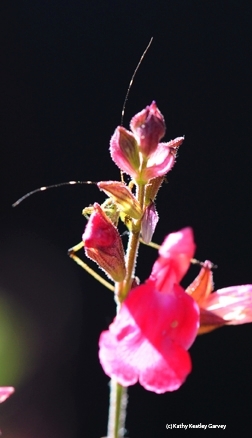 Last weekend we saw long filamentous antennae poking from behind the red salvia in our yard. Upon closer inspection, it belong to a...drum roll...katydid. 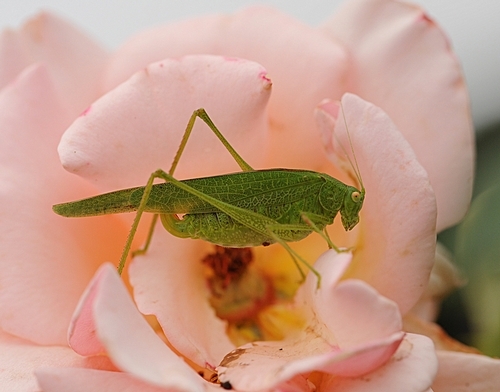 The katydid is no friend of the farmer; it can wreak havoc in agricultural crops. Still, there's something about a katydid that makes you stop and ask "Katydid or Katy didn't?" Or as Oliver Wendell Holmes pondered "What did Katy do?" 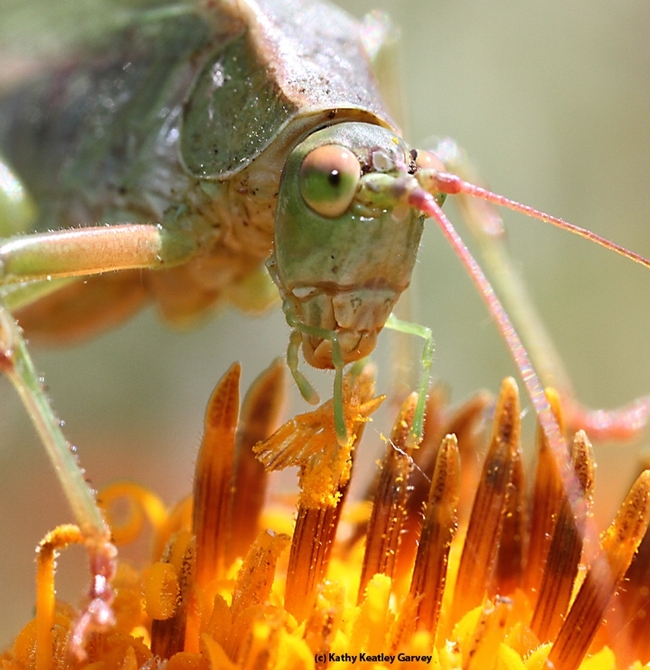 Up close, the katydid looks as ferocious as a scary Halloween trick-or-treater. Its stance is firm. Its eyes glow menacingly. Its attitude: "Don't mess with me." We spotted this katydid on a rose in a UC Davis rose garden. It towered over the honey bees, spotted cucumber beetles, ladybugs, hover flies, and assorted other insects. The katydid, in the family Tettigonlidae, is also known as a long-horned grasshopper, but entomologists point out it's more closely related to crickets than grasshoppers. Tettigoniids dine on flowers, leaves, bark and seed, and some feed on other insects.